Devoid Of Culture And Indifferent To The Arts: Sub-Continent Staple: Homemade Paneer! 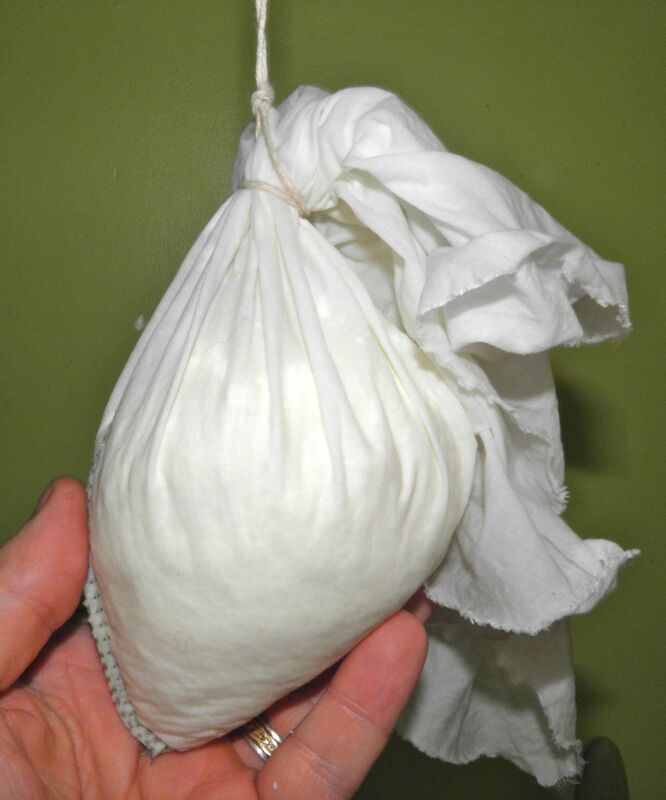 If you have ever made ricotta (search ricotta on this blog for how to do it) you will know instantly how easy it is to make paneer, the fresh cheese from India. It is essentially the same beast except paneer is pressed. The pressing gives you a firm final result, kind of like tofu. 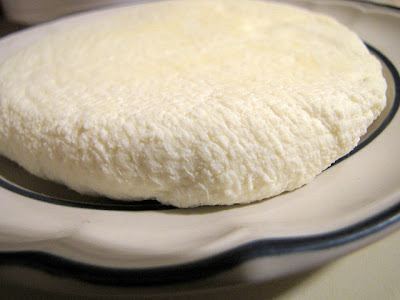 Tomorrow I will post a delicious recipe to use your homemade paneer. A “taste” of what to expect is at the bottom of this post. Paneer is a fresh cheese common in South Asian cuisine. It is of Indian origin. In eastern parts of India, it is generally called Chhena. It is an unaged, acid-set, non-melting farmer cheese or curd cheese made by curdling heated milk with lemon juice or other food acid. Unlike most cheeses in the world, the making of paneer does not involve rennet as the coagulation agent, thus making it completely lacto-vegetarian and providing one of the sources of protein for vegetarians in India. It is generally unsalted. Paneer is an ingredient used in so many recipes it would foolhardy to even try to list them, but I can give you a general idea of its usefulness. It helps to know that paneer takes on the flavours of whatever it is cooked with, much like tofu. Paneer is used in almost all the Indian curry bases sauces and saags as a meat substitute; it can be cubed and used in salads; it is sweetened and served as dessert; it is wrapped in dough and deep fried. You can also substitute it in any recipe that would call for tofu (save for some Asian dishes where tofu is really the star, I would think) and can be added in the most curious places like, for example, Mac ‘n Cheese with paneer and peas. All you need is milk and a plant acid to make it. 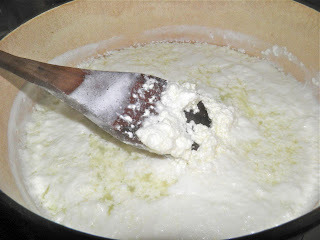 I have made ricotta with vinegar, lemon juice and lime juice, all possible to be used in paneer-making. I used the lime in a pinch when I thought I had a lemon in the refrigerator but discovered it wasn’t. Each one was slightly different. For paneer I thought lime would pair best, so lime it is for my recipe. This very instructional YouTube video shows exactly how easy it is to make. They use 1/2 gallon which is the same as 2 litres as in my recipe. Take note of what they suggest you do with the whey. It is definitely not something to go down the drain. It is substituted for water in many places like boiling rice or in making bread. It is also excellent for watering houseplants. Our dog Henry just LOVES the stuff! Makes enough for tomorrow’s recipe! Bring the milk just to the point of boiling in a heavy bottom pot, like a dutch oven. 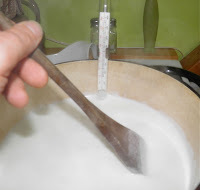 You will need to stir constantly so the milk doesn’t stick to the bottom and scorch. If it does your cheese will have a burnt taste. The second it comes to a boil, remove from the heat and stir in the lime juice. The milk should instantly separate into curds and whey. Let the curds sit covered for about 5 minutes to fully separate and cool down a little bit. It won't cool down much though, so be careful when you pour it out to drain. Carefully pour the contents of the pot into a colander that is lined with fine cotton cotton. I use a dollar store pillowcase. Then take the corners of the cloth and bring them up to enclose the curds in a pouch. Tie closed and hang over the pot for 1/2 hour. After the first drain form it into a flat squarish shape and put it back into the cloth folding it up over. Rest it on something with drainage holes if possible, weight it and press for another 1/2 hour. This helps the curds form a semi-solid mass and extracts a little more liquid. 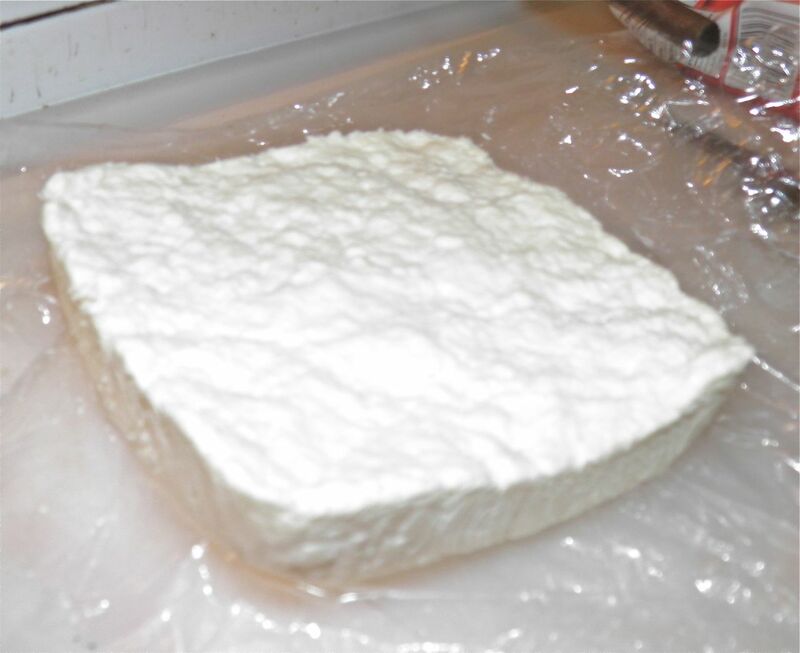 After pressing, remove it from the cloth, cover in plastic wrap and refrigerate. It will firm up even more. Tomorrow I will post a delicious recipe to use the cheese – South Indian Pudina Panner. This is a dish with a sauce consisting of spices, onions, coconut milk, cashews and mint plus other things of course. So come back tomorrow for the details!